The whistleblowers featured in the film continue the tradition of brave men and women who have come forward to tell the truth without looking for any personal gain - Daniel Ellsberg (The Pentagon Papers); Jeffrey Wigand (tobacco industry); Karen Silkwood (power plant health and safety procedures) and Mark Felt (Watergate). NEW YORK - May 21, 2013 - Filmmaker and esteemed documentarian, Robert Greenwald is on the forefront of today's headlines as his latest film War on Whistleblowers: Free Press & The National Security State uncovers the perils to the careers and livelihoods of whistleblowers, both governmental and corporate, and the threats facing journalists who publicly try to right a wrong. After a successful limited spring 2013 theatrical run, War On Whistleblowers: Free Press and the National Security State will be rushed to DVD on July 30, 2013 under TDC Entertainment label, the Disinformation Company. 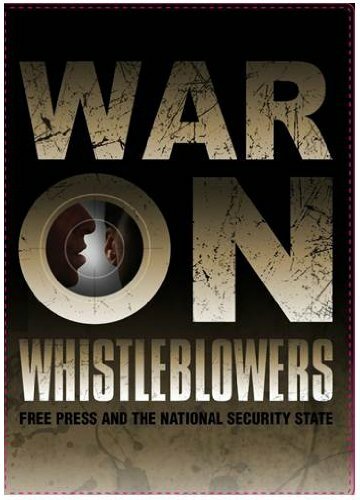 Four renowned cases of whistle-blowing serve as the backdrop to a much larger story of what happens to people who resort to the media to expose fraud and abuse. *	Thomas Drake (Former Senior Executive of the National Security Agency)--exposed the Stellar Wind program, a super secret warrantless surveillance program that violated American's privacy rights. *	Michael DeKort (Former Lockheed Martin Project Manager) -posted a whistleblowing video on YouTube after he found security and safety issues with the U.S. Coast Guard's 123 Coast Guard Cutter, manufactured for the Deepwater program. *	Thomas Tamm (Former attorney of the U.S. Department of Justice) was classified as a whistleblower when he uncovered warrantless wiretapping by the National Security Agency (NSA) under the Bush administration. An illustrious group of journalists who appear on camera to tell the whistleblowers stories include David Carr (NY Times); Michael Isikoff (NBC News formerly with Newsweek); Glenn Greenwald (The Guardian); Jane Mayer (The New Yorker); Tom Vanden Brook (USA Today) and Eric Lipton (New York Times), among others. The Disinformation Company continues its association with Robert Greenwald as the exclusive DVD distributor of his acclaimed documentaries such as Wal-Mart: The High Cost of Low Price, Koch Brothers Exposed, Iraq For Sale: The War Profiteers; Outfoxed: Rupert Murdoch's War on Journalism and Uncovered: The Whole Truth about the Iraq War. For more information on The Disinformation Company and their catalog up upcoming releases visit www.disinfo.com. The Disinformation Company Ltd. is widely recognized for distributing films on subjects not usually covered by traditional media, such as The Exorcist in the 21st Century, We Are Egypt: The Story Behind the Revolution, Robert Baer's The Cult of the Suicide Bomber and health/sustainability films like Killer At Large and Tapped. Disinformation releases are distributed by Entertainment One.